So there's this place - this wonderful magical place full of warm tortillas, savory mole sauces, and pork products in nearly every form. Oh and an abundance of spicy, salty margaritas. Where is this place, you ask? 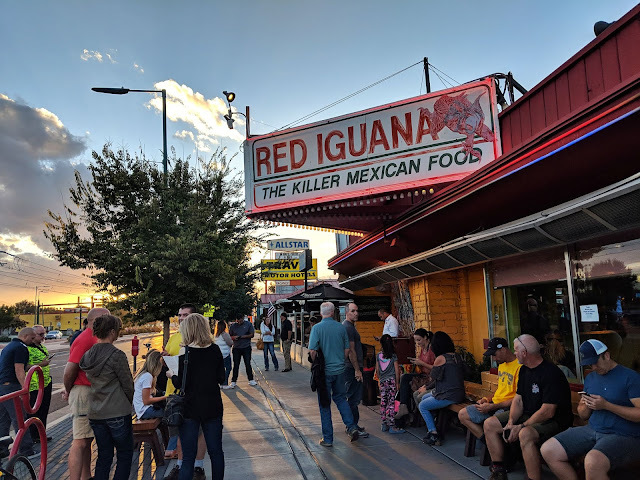 It's Salt Lake City's famous Mexican restaurant, Red Iguana. You are probably envisioning a hip and trendy taco joint smack downtown in the city. Instead, it is literally and figuratively located on the "wrong side of the tracks" at the other end of the city, about a mile and a half from the downtown area. All of this amazing Mexican food is contained in a basic nondescript yellow and red building with a huge lit up sign inviting you in to enjoy "Killer Mexican Food" right through the front door covered in a variety of random stickers. To really set the ambiance, its neighbor is a rundown no-tell motel, honeymoon suite, weekly rates, and creepy gnome characters in a no longer functioning abandoned outdoor pool included. That Travelodge sign with the creepy characters featuring "Kiddies Fairy Land"? All real. Let's just say you don't come here for the ambiance, you come for the mole.